What is this ... open season on a certain pseudonymous blogger? People seem inordinately interested in the habits of a rare Gypsy Scholar. Now, even Dymphna of Gates of Vienna and The Neighborhood of God has tagged me, attached a radio transmitter, and begun tracking my paths by satellite. Her scientific research project is titled the "Seven By Seven Meme." Or maybe, since it's now about me, this is really the "Seven By Seven Me Me!" Okay, that was a seven times seven stupid joke. Can I be forgiven? Seventy times seven times? Or is a bad joke the unpardonable sin against the Spirit? Actually, that's only seven things about me in each of six categories since the last one is about other people. Six categories? Hmmm . . . that's a bit better. But 7 x 6 (checks with calculator) = 42. That's still a lot of . . . ! Why . . . that's "the answer to life, the universe, and everything!" 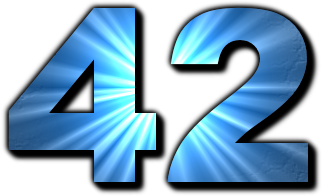 Nor can it be coincidence that 42 is a sphenic number, for every sphenic number has precisely three distinct prime factors generating exactly eight divisors. This number of divisors matches number for word the number of words in the phrase "the answer to life, the universe, and everything." Wow. Far out. Like, into the cosmos . . .
Watch out, though, 42 just isn't the answer to life, the universe, and everything. It's also the cursed number of God. How many children were eaten by the bear? A clever post that answers only 1/42 of the meme. Chris, there's also an article somewhere -- in philosophy, I think -- on the religious ambiguity of the universe. Its point was that based on the evidence from the cosmos (the teleological argument, I guess), one is justified in either belief or disbelief in the existence of God. Jessica, which 42nd part was that? Is that 42nd part one thing you can't do? Unless you did the whole 42 in one fell swoop. Can't get my head around it. Hilarious. Steph, I wish that I'd thought of that. That way, I could have incorporated a paradox. Wait ... I can pretend that I meant that! Yes! Oh, then I'd better alter this comment. Oh no, I've prematurely typed the new vocabulary word "rhqjuwdt" in the Word Verification box and inadvertently pressed the Login and Publish button. Exactly you did, that's why you couldn't - or didn't: but you did incorporate the paradox even if you fibbed! Good point, Steph, I just wish that I'd recognized it myself. Probably Gypsy Scholar knew what he was doing but didn't inform me. He does that a lot. Often, I don't have any idea what he's talking about. I was tagged by Dymphna too, what is once supposed to do? 1. Post a blog entry similar to the blog entry by Dymphna, giving lists of 7 things in the 7 categories. 2. Tag other people to post a blog entry similar to yours and Dymphna's. That's what I understood to be required . . . but I didn't fulfill the conditions and will now suffer the consequences, probably a curse of some sort. Thanks to Jim Davila, I've located the article. It was "The Answer to the Meaning of Life, the Universe, and the Elohistic Psalter." JSOT 27.2 (2002): 223-235. Chris, thanks. I presume that the article is humorous.